Nebraska, Oklahoma, and California will test the prospects of abolition. The ballot measures and races — beyond Washington — that could shape criminal justice. 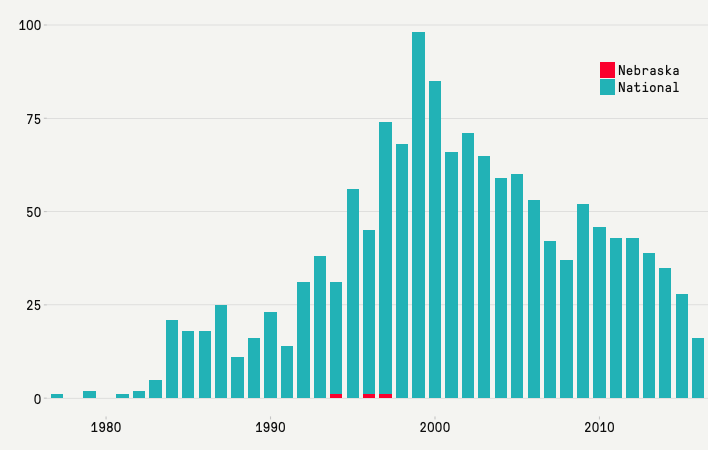 Public support for the death penalty is at its lowest level since the Supreme Court suspended capital punishment in 1972. A Pew Research poll published late last month revealed that only 49 percent of Americans now favor executing murderers, a seven-point decline from March 2015. Those poll numbers may reflect growing public concern about botched executions, the high costs of operating death rows, and the suspicion that states may have executed innocent people. The polls have lifted the hopes of death penalty abolitionists as more states move away from executions either in policy or in practice and as execution rates keep falling. That momentum, however, is about to run smack dab into four ballot measures in three states that will test the popular mood and perhaps shape the national debate over capital punishment into 2017 and beyond. In Nebraska, the issue pits the Republican governor against a bipartisan majority in the legislature. Citing the cost of housing inmates on death row through years of appeals, along with a lack of deterrent effect, a coalition of lawmakers last year repealed the death penalty over the veto of Gov. Pete Ricketts. First, Ricketts threatened to execute the 10 people on the state’s death row anyway. Then, realizing that was illegal, he settled for strongly supporting, financially and otherwise, the ballot measure voters there will face next month to override the repeal and reinstate capital punishment. In Oklahoma, ardent supporters of capital punishment hope to insulate the death penalty against judges they perceive to be wobbly on the issue. The state has a long history of capital punishment. But a widely-cited poll there last year revealed that most residents now support life-without-parole as an alternative to execution. 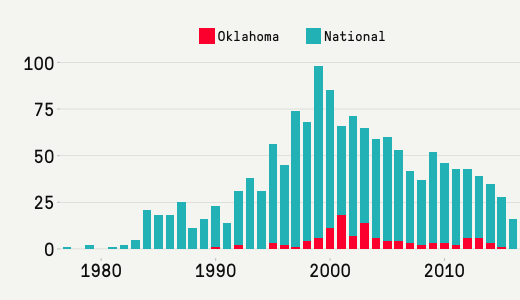 And the year before that, two Supreme Court justices — in the Oklahoma case of Glossip v. Gross, which upheld the use of a controversial sedative in executions — took the opportunity to raise anew questions about the constitutionality of capital punishment. Neither the Oklahoma electorate nor the Supreme Court seem close to abolishing capital punishment, but proponents are taking no chances. An initiative on the November ballot seeks to proactively protect capital punishment by enshrining it in the state’s constitution and by explicitly declaring that it is not “cruel and unusual punishment” under the Eighth Amendment. The political sponsors of the Oklahoma initiative also thought capital punishment there could use a boost after one of the more sordid episodes in the state’s recent legal history. Two years ago, in the case of convicted murderer Clayton Lockett, the state’s two supreme courts — one handling civil matters, the other handling criminal matters — disagreed on the validity and scope of the state’s new lethal injection secrecy law, a measure designed to protect the companies providing execution drugs. Gov. Mary Fallin announced that she would abide by the ruling with which she agreed (which would have permitted Lockett’s execution to proceed) and ignore the one with which she did not agree. Rep. Jordan and his colleagues even moved to impeach the justices who had sought to delay Lockett’s execution. The state supreme court that had blocked the execution ultimately caved to the political pressure and Lockett was executed, famously, in a procedure that was so horribly botched that the state has not to this day recovered from the legal and political fallout. So State Question 776 was born as a way to insulate the death penalty from the possibility that the state supreme court might not back down next time, Rep. John Jordan, one of the sponsors, told me last week. He and his colleagues were also worried that what had happened in Nebraska — a legislative repeal of the death penalty — could happen in Oklahoma. He said the initiative should be seen in concert with a legislative push to replace lethal injection drugs with nitrogen gas as a means of executing the state’s condemned prisoners. Finally, California voters will face two competing initiatives that clearly mirror the broader national debate over the future of the death penalty. One side wants to end capital punishment altogether in the Golden State, saying it has been an expensive and ineffective experiment. The other side, pushed by prosecutors and police, wants to “mend, not end” capital punishment by changing appellate rules to expedite capital cases, reducing the costs of the death penalty and the size of the state’s death row. It’s been an enormously expensive fight. The Prop 62 forces (for repealing the death penalty) have raised over $7 million. The Prop 66 forces (for accelerating it) have raised at least $5 million. Much of the debate in California, and in Nebraska, centers not only on retributive justice but on the costs of maintaining death row and litigating appeal after appeal. A recent study by an economist at Creighton University pegged the costs at $14.6 million per year, a figure that opponents of capital punishment say proves their case and that proponents of capital punishment, including the state’s attorney general, say is wildly high. 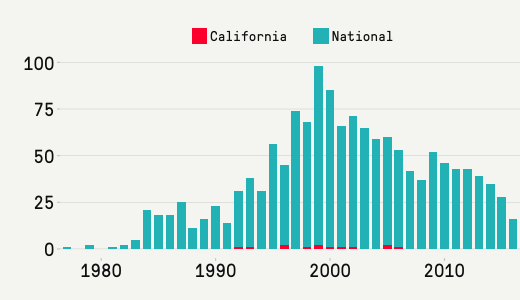 In California, advocates for Proposition 62 say the state has spent $5 billion maintaining the legal and physical apparatus of capital punishment while actually executing only 13 people since the death penalty returned to the state in 1978. Advocates for Proposition 66 say those high costs can be reduced measurably — $30 million per year, they claim — by streamlining the appellate process and cutting the costs of the state’s death row. Haydt identified half a dozen ways, at least, in which she believes the new state paradigm could violate the constitutional rights of California’s condemned. For example, Proposition 66 “provides no financial appropriation for training, investigation or experts” in capital appeals, which means the funds will have to come out of county budgets, which means there almost certainly will be lengthy litigation over whether that funding is sufficient to protect the due process rights of those sentenced to death. Speeding up capital cases would take an enormous commitment of resources that Proposition 66 simply doesn’t provide, she argues. Pew’s national poll numbers aside, the death penalty for years now has been a regional punishment, not a national one, largely confined to the South and West, where skirmishes over its application will continue to play out the way we see it this election. A mixed verdict on the four measures won’t change the national narrative reflected in the latest polls. 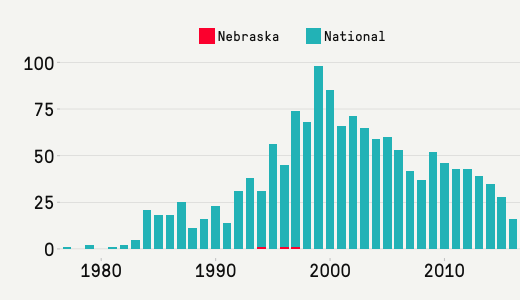 But if the death penalty is restored in Nebraska, protected in Oklahoma, and expedited in California, we’ll know there are clear popular limits to the abolitionist movement. And if voters choose to keep the death penalty dead in Nebraska, kill it in California and leave it be in Oklahoma, the latest poll numbers will look more like a trend. Either way, these local battles, and not some grand pronouncement from the Supreme Court in Washington, are how the future of capital punishment will be decided.